As mayor of a growing city you control whether your citizens will live in an urban paradise or an urban jungle. 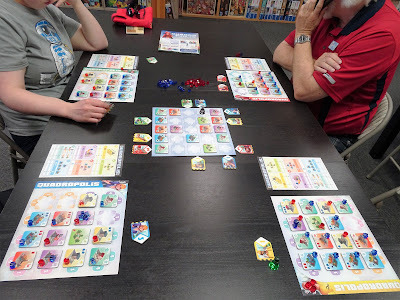 Quadropolis is a game with easy mechanics and deeper game play than it first appears. With double-sided individual player boards and double-sided architect tiles, Quadropolis provides two levels of play; Classic which allows for an easier discovery of the game mechanics and various strategies, and Expert which introduces new buildings and some rule changes to provide more challenge. The Classic game lasts 4 rounds with players taking 4 turns per round. The central game board has 25 squares laid out in a 5x5 grid where various types of building tiles are randomly placed at the beginning of each round. Each round has its own set of buildings. A player’s turn consists of playing 1 of their 4 architects next to a column or row on the central game board, taking the building tile associated with the number on that architect, and placing the building tile on the most advantageous space on their own city board also corresponding with the number of that architect. Each player has 4 architect tiles numbered 1 through 4. On a round, players must use each architect and can only use each one only once. As each round progresses, it gets increasingly more difficult to get the building you want with the architects you have left. Just to make things interesting, there is an “Urbanist” pawn that gets placed where the last building was taken. The next player cannot not claim a building in the row or column that is occupied by the ”Urbanist”. When played on a player’s individual city board, buildings can bring inhabitants, energy units, or victory points. Inhabitants and energy units will be used to activate buildings at game end. Only activated buildings will be scored. Balance between buildings, inhabitants, and energy units is essential. Players with unused inhabitants and energy units will receive one negative victory point for each. After 4 rounds of 4 turns each have been completed, each of the 6 different types of buildings are scored. Tower blocks are scored by how high they are up to a max. of 4 floors. Shops are scored by the number of inhabitants they have attracted as customers. Public service buildings score by the number of different sectors they occupy. Parks score based on the number of Towers adjacent to them. Factories score for having Shops and Harbors adjacent to them. And Harbors score by how many in a row and/or column. The player with the most victory points wins. Once the Classic game is mastered, flip the architect tiles and the player’s city boards over to the expert side. Architect tiles are now numbered 1 through 5 and are all placed in a central pool for every player to pull from. Player’s city boards have a fifth sector to fill and another building type to construct, the Office Towers. In addition, there will be 5 rounds of 4 turns each. Office Towers are scored based on a combination of adjacency and number of floors. Scores for all other buildings are amped up for the additional type of building, additional sectors and/or additional rows and columns. Play the family friendly Classic mode for a quicker and lighter game. Go to the Expert mode when you are looking for a deeper gaming experience. Either way Quadropolis will keep you engaged throughout.